Coffee is really the lifeblood of so many people. There are already so many great health benefits to coffee in addition to giving that much needed boost in the morning. But what if you add the extra benefits of mushrooms? This is everything that you need to know about the new trend of mushroom coffee. Mushroom coffee is almost exactly what it sounds like. Different types of mushrooms, especially cordyceps and maitake mushrooms, offer various benefits so you can purchase these different varieties. Essentially in every variety, coffee is infused with medicinal mushrooms. These can be purchased in instant coffee varieties for convenience where you can still get the benefits of this type of coffee. The mushrooms are harvested then go through a process of liquifying and drying them. This will create an extract that can be mixed with coffee. Something interesting to know about mushroom coffee is that it was actually used as a coffee substitute during World War II, where places like Finland used chaga mushrooms for coffee since there was such a short supply of it in their country. Created from mushrooms that were commonly used in ancient Asian medicines, mushroom coffee boasts the benefits of both mushrooms and coffees while also reducing the anxiety and insomnia that often comes from drinking this popular morning beverage. You can even purchase this type of tea with other herbs in it to offer additional health benefits, such as peppermint. There are different flavors of coffee that you can purchase to not only enhance the flavor of your coffee but to bring additional health benefits. The most common form of this that you can purchase is instant coffee, which means that you can have packets that can move on the go with you or that you can quickly prepare when you want a healthy pickup during the day. 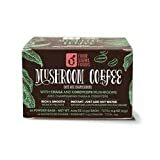 Even without the additional flavoring, you may be surprised to find that the mushrooms used in this coffee have a similar flavor as coffee does. As for nutrients, there are numerous vitamins and minerals in this healthy alternative to traditional coffee. There are some side effects that you should be aware of. If you have an autoimmune disease, your symptoms can worsen when using mushroom coffee. Other side effects can be dependent on the types of mushrooms in the coffee, so be sure to carefully research them for their side effects. Be sure to discuss adding mushroom coffee to your diet with a doctor and it is recommended that you do not consume more than 2 servings a day.